Increase your sales with our auto transport broker leads program. Here at iMover Leads we specialize in generating high quality Auto Transport Leads exclusively for the auto transport industry. Start receiving hot, real time, quality auto transport leads today! Join our network and immediately begin receiving leads you can count on for your auto transport business. Receive our transport leads directly into your auto transport broker software. Whether you use Jtracker, MegaBee, Auto Broker Dispatch, just to name a few, we are already setup and integrated with all the top auto transport software providers in the industry. All you have to do is tell them that you want to receive leads from iMover Leads, and they will provide you an “unique” email address, that you will then give to us so we know where to send your auto transport leads. How the internet has changed marketing for your Auto Transport Broker Business? Today’s consumers are turning to the web as their main source for information and resources. Because of this it has made the internet the #1 resource for connections between consumers and business owners, including Car Shipping Companies. Unlike the phone book or paper advertising, advertising on the internet firmly puts you in charge of your budget for marketing, rather than sitting back and waiting for your phone to ring. Some auto transport brokers think that internet searcher or consumers are only shopping for the cheapest price. However, this is not true! We have found through various survey’s and research that online searcher consumers are looking for fast, reliable accurate information to ship their vehicles. Contact us today, to learn more about the power of the internet and how iMover Leads can help grow your business by providing you with one of our many auto transport leads packages to choose from. Each unique quote request that we generate is sent to 10 auto transport brokers. iMover Leads guarantee’s a maximum cost of no more than $1.25 per lead. However, throughout the year our lead cost averages around $1.10-$1.25 per lead, depending on seasonal fluctuations. If you would like to start receiving leads, fill out our e-sign application on the Sign-Up Now page. Within 5 minutes we will process your application, and activate your auto transport leads. There are NO CONTRACTS, our services are month to month, you are free to start and stop your leads at any time. NO SETUP FEE’s! We know you have many choices for Auto Transport Lead Providers, however not only do we provide you with high quality Auto Transport Broker Leads, but we back it with our excellent customer service. Our lead services are setup and integrated with all major auto transport software providers, such as Jtracker. 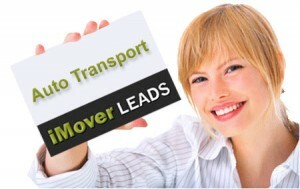 To start receiving leads in your software contact your provider, and tell them you want to start receiving leads from iMover Leads, they will provide you with a unique email address, add this email address to your leads application, and within minutes you can start receiving our auto transport leads. We believe you should only be paying for high quality leads you can rely on. Unfortunately, we cannot control what customers choose to enter into our lead generating websites. Therefore, if you receive a lead that you are not able to call and email due to “bogus information”, we will credit you at the end of the billing cycle or send you more leads to compensate for anything bogus. In an effort to keep the quality of our leads, we have setup a duplicate tracker within our system to flag and NOT send any duplicates to our customers. Give your business that extra SALES BOOST you’ve been looking for! With the industries highest conversion rates, increased rates of return, and best customer service, what are you waiting for? Call us today to start receiving our Auto Transport Broker Leads, (888) 221-6602.